Bridget Federspiel works with both high school students and Wright State student veterans to interview U.S. veterans for the Library of Congress (Photos by Erin Pence). Federspiel grew up in Kettering, graduating from Fairmont West High School. 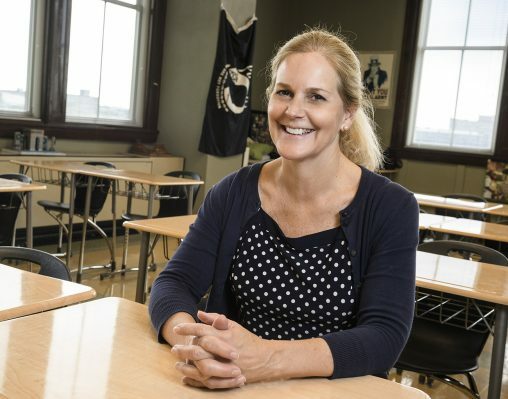 She earned a bachelor’s degree in history with a minor in education from the University of Dayton in 1989 and over the ensuing years taught at Bethel High School, Springfield Catholic High School, Chaminade-Julienne High School and Wilmington High School. In 2001, Federspiel won a James Madison Fellowship, enabling her to get her master’s degree in history from Wright State. As a graduate student, she was encouraged to participate in the Library of Congress Veterans History Project by Marjorie McLellan, associate professor of urban affairs. The project collects and preserves firsthand remembrances of U.S. wartime veterans to ensure that future generations better understand the realities of war. Federspiel’s first interview was with a Xenia man who had served in three wars. So in 2005, Federspiel and her students started their own veterans history project. Federspiel finds many of the veterans through word of mouth, with one veteran referring her to another veteran and so forth. She also has made connections with chapters of the Veterans of Foreign Wars. The interviews can be a lot of work. When they are conducted at the homes of the veterans, Federspiel must transport her student interviewers because they are too young to drive. Each interview must be 30 minutes long. There is paperwork to do, photos to be taken, and the interviews burned to CDs and DVDs. So far, Federspiel and her students have collected 555 interviews and sent them to the Library of Congress. Since she began the project, Federspiel has twice traveled to the Library of Congress to check up on her hundreds of interview contributions. 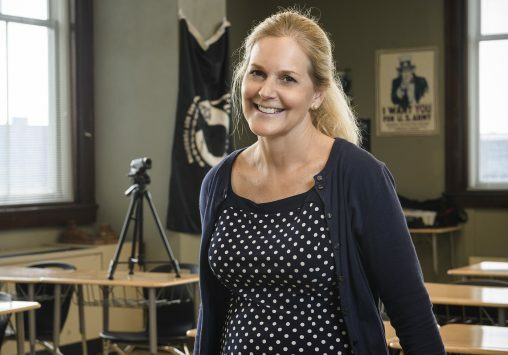 Bridget Federspiel earned her master’s degree in history from Wright State and also teaches a Veterans Voices class with the university Veterans Military Center. Most of the veterans tell the students the military was good for them, that it straightened out their lives and gave them discipline. But virtually all of them say it’s necessary to try to avoid war at all costs. Many of the veterans who were interviewed have since died. “I’ve had wives call me or send me a card saying, ‘We played the interview at his wake,’” Federspiel said.